Proactively, I decided to find out what “Kaugis” means in English, but it doesn’t mean anything. But wait…maybe it does. I finally found myself on Katjes’ web site, where they pronounced Kaugis to mean “one is happy while chewing”. Is it me, or are other countries, despite being far superior candy makers, seriously corny? We’ve seen these time and time again, right? So I thought. But the proof is in the perennial pudding on these. Yes, they’re soft-which…I really thought wasn’t my thing, but now I’m reconsidering that. According to Katjes, these are made with real fruit juice and fruit pulp. Pulp! When I say that you can taste it, I mean it – these are absolutely delicious. Again, they’re not a tough chew, but that probably doesn’t disappoint most people. If you savor them, the flavor explodes after a few moments. There’s 6 flavors: lemon, strawberry, cherry, and I’m guessing blueberry, cranberry and orange. 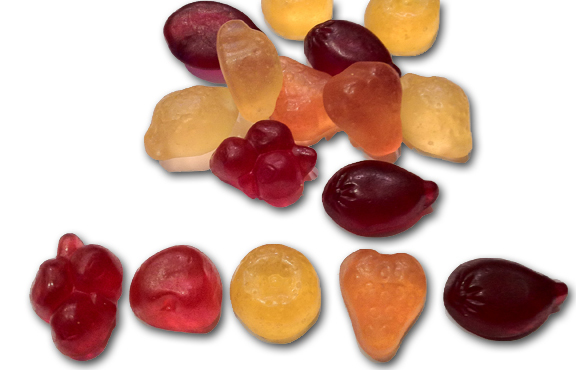 Every single one of these flavors is tart in real life, and the full flavor of these fruits-tarts, sweet, and complex layers-is all represented in the gummies. I can’t say enough about how the flavor develops while sucking on these. Here’s the best part: there’s now a place for us to buy these, as well as several other varieties of Katjes, Haribo, and Trolli candy. Germanshop24.com not only has a nice variety and the most reasonable shipping rates I’ve found, but- get this- they’re trying to open a warehouse here in the US, which will lower shipping rates even more. I’ll expand more on this in the coming weeks, but for now, feel confident in clicking the link below to purchase some of these lovelies. I think these are something that everyone will enjoy. “Kaugi” is sort of a cool neologism on the German word “Kaugummi”, in the same way “thingy” is a tweak on “thing” in English… sort of a contraction of the word “Kaugummi”. 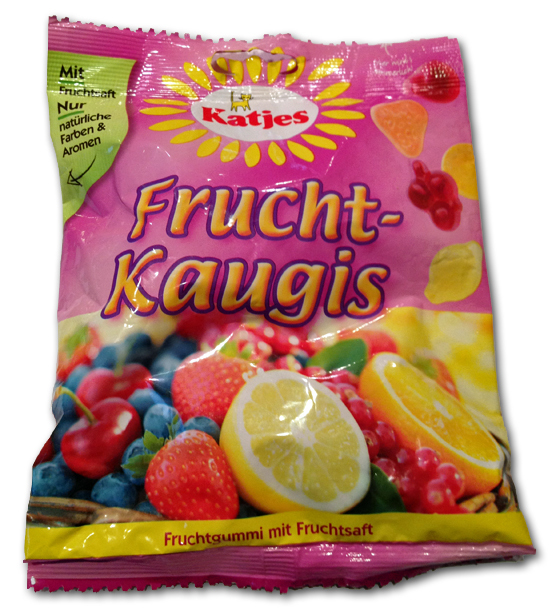 “Kaugi” is a word parents would use with very small children, much in the same way Dada refers to Daddy, etc… “Kaugummi” is a candy that is chewy or can also refer to chewing (kau) gum (gummi) in German. Hope this helps. Wow, that does help. Thanks! Katjes is one of my favorite Germany candy companies, two must tries from them are Saeure Johannisbeeren (no american equivalent, but great texture and sour) and Joghurt Gummis, they are these soft and creamy but really flavorful (Pear is my favorite, though all are good), I have only seen both once in the US, in this little german import shop in San Francisco, very expensive though. Kaugummi is “gum”. Kaugis means literally “chewies”. The verb to chew is kauen. And yes, Germans make everything better than we do. They have better cars, food, houses, streets, candy, toys, you name it. German chocolate “Ritter Sport” and “Milka” is far superior to anything we have over here. Germans prefer to buy things of the highest quality. They would rather pay more and get something well made, then buy garbage like we do for low prices. People like to think America is #1, but it is more like America is #27 as far as products, food goes.